Other tasks were vying for my attention this week, so there wasn't a whole lot of sewing happening. But a few things still got made! Mostly because this adorable pink fabric from the Tiny Happy Lucky collection is new to me and sometimes all you need to make it happen is some new fabric. I've had this cherry print before, but in the aqua colorway. Quite a few Cord Keepers were made from the blue version and when it ran out, I ran out (aka: sat down at my computer) and got some more. The links are to the shop where I purchased this fabric. She was quick to respond to a request for a custom cut and shipped right away. I'd definitely shop with ShuShuStyle again. If you are outside the US, these three colors are also currently available in modes4u's etsy shop. They are in Hong Kong, which (I think?) makes for less expensive shipping and faster transit times for those of you in the EU/Eastern Hemisphere. This is the small size in the Cord Keepers pattern (also available here on etsy or here on Craftsy). This is Size 1 in the Card Wallets pattern (also available here on etsy or here on Craftsy), but with a size 24 Snap Source snap in matte black. And finally, one fat eighth of this print is available here if you just want a small piece to add to your stash. For a while now, pattern pieces for a second size of the Zip Pocket Pouch Wristlet have been available, but kind of hidden away here on the old blog. But I'm happy to announce both sizes are now in the pattern! If you have the pattern with just the first size, get in touch with proof of purchase and I'll send you a coupon so you only have to pay the $2 price difference. 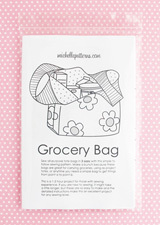 Proof of purchase could be a link to an etsy purchase, a PayPal receipt, the download message, or post a photo of a finished bag (front page of the pattern is fine too) on Instagram. My email is my first name at michellepatterns.com. So this is a good time to talk about this pattern again. 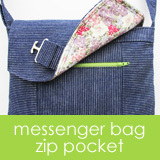 These bags are really quite simple to make and this is the easiest zipper installation of all my zipper patterns. It's just so, so easy. I don't recommend this pattern for beginners, but if you are getting pretty comfortable sewing, but haven't tried a zipper yet, this is a great project to give zippers a try. These also don't take long to sew. If you are fairly experienced making accessories, this is a 2 or 3 hour project. Size 1 is a good size for many phones, Moleskine Pocket Cahier journals, or to use as a small clutch/wallet. The main pouch will hold a phone up to 5.5" x 3.5". The zippered pocket will hold a phone up to 4.87" h x 2.31" w x 0.30" deep (iPhone SE or smaller). Size 2 will hold a tablet computer or journal measuring up to 7.5" x 10" and up to 0.5" deep. So this will work for an iPad 2, 3, 4, or 5. Photos show it with an iPad 3. It will also hold an Extra Large Moleskine Cahier or a composition notebook (aka: exercise notebook). The pattern is written for a swivel clip (aka: lobster clip) with a 0.5" attachment point and a 0.25" opening. If you want to use other clips, cut the strap piece 4x the width of the attachment point and cut the footing piece 4x the opening measurement. Since Size 2 is quite a bit larger than Size 1, you can quilt lining D and the muslin/fleece D pieces together with a few stitching lines to hold all the layers together. It's not required though. In the photo above, you can see where I've quilted down the middle and then once to each side. It takes close to no time at all. You can also add more interfacing and/or fleece to Size 2 if you want more structure. Interfacing can be added to lining A and/or lining B. You can also use fleece on lining B to provide more padding. If you use fleece, cut away both top corners of the fleece B to remove some bulk from behind the zipper ends. I've made a bunch of these using a piece of patchwork for the lining D piece. This isn't in the pattern, but it's simple to do if you have experience foundation piecing together fabrics for patchwork. Before I tell you how I make patchwork lining, keep in mind these instructions reference steps in the Zip Pocket Pouch Wristlet pattern, but can be used for other things. Just ignore the pattern step references and follow the general idea. One last consideration is that it's best if the patchwork seams do NOT intersect the snaps on D. Just mark them on the muslin so you know to avoid having seams in that general area. Cut the fleece piece out using the D pattern piece. Trim fleece D following the steps in 4.a - 4.c. Rough cut a piece of muslin 0.25" larger than D.
Foundation piece scraps of fabric together until the entire muslin piece is covered. Center the trimmed fleece on the WS of the patchwork/muslin piece and fuse it in place. Make sure to use a press cloth over the fleece so it doesn't melt on your iron. On the RS, center the D pattern piece on the patchwork. Take a look at the back to see if D is fairly centered over the fleece piece. Trace the pattern piece D outline on the patchwork. Quilt the patchwork. Quilting is optional, but I almost always stitch around the pieces because I like how it looks. Baste 1/8" inside the D outline. This part is NOT optional. The patchwork seams will split open and it can cause you problems while sewing. Don't skip this one! Cut out the D piece. This post contains affiliate links to etsy products. I went on the search for chicken fabric on etsy the other day. It started with the Alexander Henry chicken print above and then I just kept going. 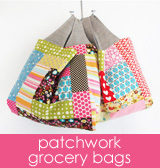 There are many delightful chicken print fabrics and of course, they'd be perfect for Grocery Bags.